SCVHistory.com JD8301 | Judiciary | Photo Gallery: Enrobing Ceremony for New Judge H. Keith Byram, 2-2-1983. The election of a local Municipal Court judge was still big news in 1982 when H. Keith Byram, a conservative San Fernando court commissioner, defeated local activist-attorney Dan Hon in the race to succeed Judge Jack Clark, who was retiring. There were only two court seats, and they weren't often vacant. The other seat was held by Judge Adrian Adams, who had been appointed by Gov. Ronald Reagan in 1970 when the second seat was added. Six candidates jockeyed for the spot in the June primary (see below); finishing out of the running were Deputy D.A. Myron L. Jenkins, attorney Richard A. (Rick) Patterson, CLWA board member and court referee Byron C. Finley, and court referee Ansley Q. Hyman. Hon edged Byram in the primary but failed to garner the 50 percent-plus-1 vote needed to avoid a November runoff, which Byram won by a decisive 58-42 percent margin. 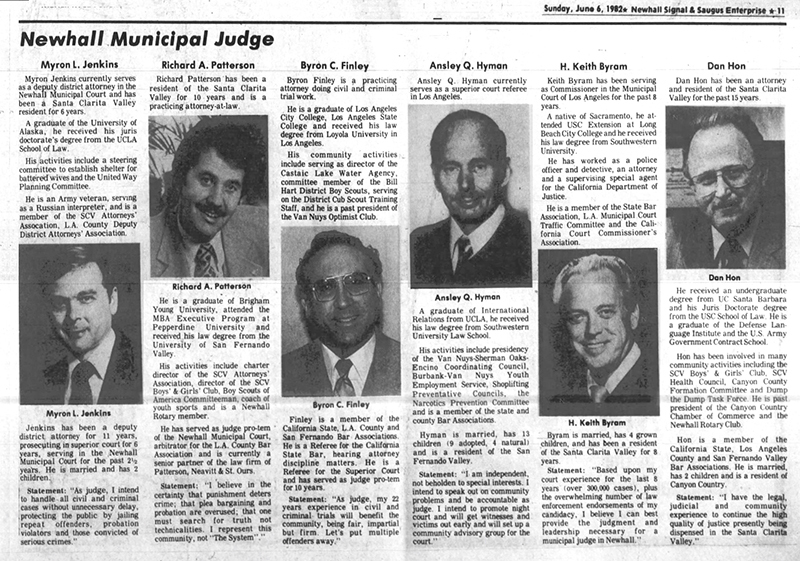 Byram was unceremoniously sworn in January 3, 1983, and was already performing the duties of the office when the formal "enrobing" ceremony took place at the Valencia Civic Center courthouse a month later. Supervisor Michael D. Antonovich administered Byram's (second) oath of office. Photos from the collection of Jo Anne Darcy, Antonovich's local field deputy. Byram retired in 1998 and was succeeded by Sand Canyon resident Cynthia L. Ulfig, an appointee of Gov. Pete Wilson. The Municipal Court merged into the L.A. County Superior Court two years later. Byram died in 2003. By Paul Dworin, Signal Managing Editor. The Newhall Signal and Saugus Enterprise | Friday, February 4, 1983. It was the first enrobing ceremony ever held at the Valencia Civic Center courthouse. But despite the historic nature of the occasion, jocularity and easy banter was the order of the day Wednesday when Keith Byram was officially given his oath as Newhall Municipal Court judge. The oath was administered by Supervisor Mike Antonovich, whose open support helped Byram defeat Newhall attorney Dan Hon by a convincing margin in last November's general election. About 75 friends and supporters crowded into the Division II courtroom over which Byram has presided since being sworn in on January 3, to participate in ceremonies that were anything but solemn. Even the usually staid Antonovich seemed carried away by the informality of the event. Joking that Byram was a man who had "overcome the Hollywood Division" of the Los Angeles Police Department, Antonovich went on to laud him as a fine judge and an asset to the community. Prior to Antonovich's administering of the oath of office, brief remarks were made by Byram's colleague, Newhall Municipal Court Judge Adrian Adams. Adams and the now-retired Jack Clark, whom Byram is replacing, were Newhall Municipal Court judges before the court was moved to its Civic Center location ten years ago. Adams ended his remarks by tossing a verbal bouquet at Byram, saying, "it's a delight to work with him." Jo Anne Darcy, Supervisor Antonovich's local field deputy, followed Adams to the podium and continued the light jesting. "But all kidding aside," she said, "we're lucky to have a man like Keith Byram as our judge. She then presented Byram with a gold eagle statue from "(Curt) Darcy and me." Byram's wife, Virginia, did the actual enrobing, ordered her husband to take off his jacket because "I know from experience this (the robe) won't fit over it." Displaying the robe, Mrs. Byram joked that whereas in years past (when Byram served as a Superior Court Commissioner) they had replaced the robe's sleeves on an annual basis, "this time we sprung for a whole new one." Byram, who recently has been gaining quite a reputation as a humorous master of ceremonies, was slightly more subdued when it was his turn to address the gathering. "I'm delighted to be the first," he said, referring to the enrobing ceremonies, and then proceeded to introduce and acknowledge his campaign committee and other volunteers. Byram singled out Antonovich for praise because "he put his political head on the block by supporting me." He offered special thanks to "Mr. and Mrs. Canyon Country," Ken and Anne Lynch, "whose support in Canyon Country pushed me over the top." Byram wrapped up his remarks with a pledge: "I will truly fulfill the duties of the job, and hope to be here for many years to come." Following the ceremonies, the Byrams hosted a luncheon at the Backwoods Inn in Canyon Country. JD8301: Download archival scans here. Filenames of archival tiffs correspond to numbers on back of prints.